The average price of a home infrared sauna is about $2000. Does that mean you can’t enjoy the amazing health benefits of infrared therapy? Is there a way to lower the cost of your own near infrared sauna to $100 or less? You can make your own infrared home sauna for less than $100 , quite easily. 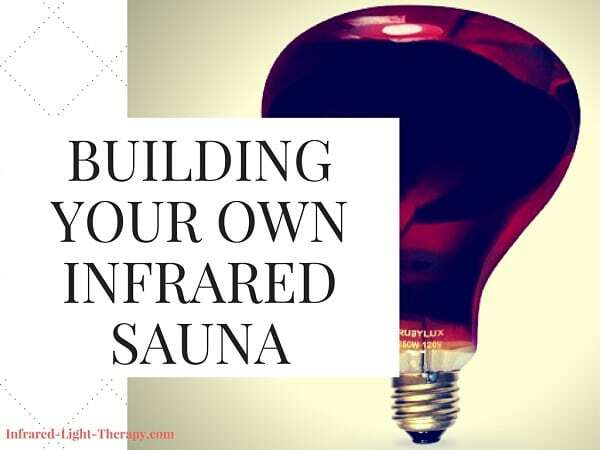 How exactly do you build your own infrared sauna at home? What supplies do you need? How much do they cost? Where do you get them? Should you build a near infrared or a far infrared sauna? What are the step-by-step instructions? 4. The health risk you’ll avoid by choosing near infrared over far infrared. 1.1 How Much Space Do You Need? 4 Is a DIY Infrared Sauna Safe? Does it Emit EMF? 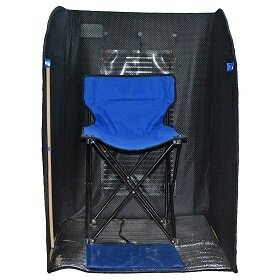 Any small room (5′ x 5′) where you can install two stand-alone IR heaters can be turned into an infrared sauna. You can build an enclosure or cabinet that will be permanent. The infrared sauna space can be even smaller so you can heat it up quicker and at less expense. You could also use a closet if it’s large enough and empty. Some people build a small tent-like structure. 👉You can also save yourself some time and work and get a portable infrared sauna for less than $160 on Amazon HERE. Make sure your sauna space is not built with flammable materials and that you keep those out of the sauna. Stay away from knotty pine which can release sap and stay away from cheap paneling with glues that can release toxins when heated. Let’s see the supplies you’ll need and where to get them. You can buy these infrared heat bulbs at a hardware store, or you can simply order them on Amazon. You can also buy a pre-made 4-light near infrared panel on Basswood (with a lifetime warranty!) – HERE. Next, you’ll need something to run the bulbs safely, without a fire hazard. 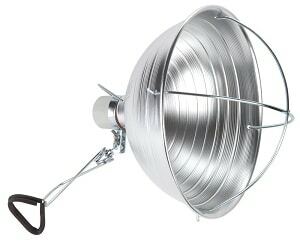 For each infrared heat bulb, you’ll need a clamp lamp rated for 300 watts. Through my research, I prefer the Bayco SL-302B3 10-1/2-Inch Brooder Clamp Light with Porcelain Ceramic Socket. It has a heat-resistant porcelain socket and rated at up to a 300-Watt incandescent bulb. Next, you’ll need a place in your infrared sauna space for clamping the lamps. If you happen to have a shelf, you’re all set. If you don’t, you can buy a simple wire rack with 2-3 shelves to clamp the lamps at three heights to cover a larger area on your body. Make sure the lamp and lampshade do not touch the rack because they will get hot. To help you with the sweating process, you may need an additional heater (depending on the size of your home sauna). Just make sure that the heater you have (or buy) can run at 750 watts or less, to avoid tripping circuits. Also, make sure that the heater doesn’t emit too much EMF (electromagnetic radiation). Use a thermometer to track temperature inside your sauna. That’s it, your home infrared sauna is ready. Make sure you are physically fit to use a sauna, consult your doctor first. When the heat lamps are turned on, do not look straight at them. Use safety goggles every time you go in. If you’re preparing your near infrared sauna in your bathroom, use a power strip that can trip a circuit, and turn it off when not using the sauna. Keep electricity away from water! Before you go into your sauna space, get the temperature up to around 100 degrees, using the infrared bulbs and the heater. You can probably safely stand temperatures up to 120-130 degrees. You’ll get a good 20-30 minute sweat before the temperature reaches 120. An infrared sauna is not like a dry sauna. To fully absorb the healing infrared rays, you’ll have to stand or sit directly in front of them. If you sit in front of the heat lamps, use eye goggles. 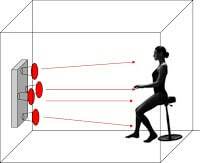 The infrared rays will not bounce back from the opposite wall back to your body. They will be absorbed in the wall. Keep a safe 12 – 24 inches distance from the near infrared lamps. Also, do not heat your head with the lamps, do not point them to your brain (which is sensitive to temperature changes). If you feel uncomfortable in any way, or that the heat is too strong on your skin, move further away until you feel a relaxing, gentle heat. You can use your sauna haven every day, or at least a few times a week, and enjoy the pain relieving and detoxing benefits of your own near infrared sauna. Make sure you replace minerals that are lost from sweating. Definitely work with a knowledgeable practitioner on this, as minerals are a tricky thing and we do not advise randomly supplementing. Drink lots of water before and after using your sauna. Relax for a few minutes after each session. Is a DIY Infrared Sauna Safe? Does it Emit EMF? EMF radiation can be dangerous. Overexposure can even cause cancer. Does a near infrared sauna emit EMF radiation? If you sit at a safe distance, there is almost no EMF radiation. Why do I recommend a near-infrared home sauna over a far infrared sauna? Some far infrared saunas (which typically use either a carbon or ceramic heater) are concentrated hothouses full EMF radiation. So, instead of a detoxifying and longevity promoting experience, it turns into a hanging out in a microwave experience, leaving you with cell damage and brain fog after each session. This is why on this website we only recommend tried and tested low EMF infrared home devices, such as the Biomat (which comes with a built-in EMF blocker between the wall outlet and the controller device). 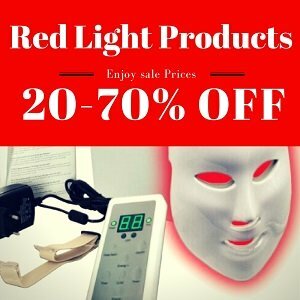 👉See the best infrared light therapy devices comparison HERE. An infrared sauna is like having a tiny little temperature-controlled sunshine heaven inside an enclosed space in your home – without the UV radiation. A DIY infrared sauna can be built with less than $100. An infrared sauna is a great way to heat your body from the inside out, which speeds up every healing process in your body while detoxifying it through sweat. A near-infrared home sauna is safer than a far infrared DIY sauna because it has no EMF radiation. 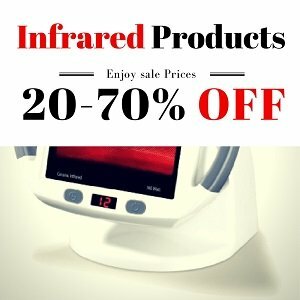 What’s your experience with infrared saunas? Have you ever tried a few sessions at your local spa? How did it affect your health and well-being? Not sure you’re up for this? see how to find the best infrared spa therapy place near you. Hello, thanks for all the info, but I’m a little confused. You seem to promote and only recommend near infrared vs. far, but yet in your 2017 review of the the three best two person saunas, they are all far infrared units?? Also, in the DIY near infrared you suggest a small area of 5′ x 5′ or even smaller, but then recommend keeping a safe 12′ distance from the bulbs. Again, I’m a little confused. Any help to clear things up would be greatly appreciated. Thanks for helping me correct a mistake! I meant 12 inches not 12 foot of course. I’ll fix it in the post now. I recommend both near infrared and far infrared. BUT: If you build your own sauna you’ll need the near infrared light to be safe from EMF. The commercial far infrared saunas include EMF PROTECTION inside them (you can see in my review post that I only recommend low EMF far infrared saunas). 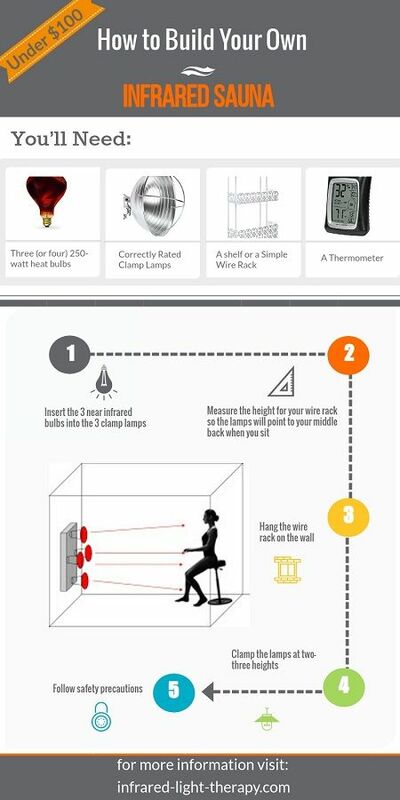 A DIY home sauna requires near infrared bulbs which emit very low to no EMF radiation. Thanks for the prompt response and clarification. I assumed you meant to say 12″ but wanted to be sure. One more question: so which do you prefer and think is more beneficial, near infrared or far infrared with EMF protection? The arguments and opinions on the internet go both ways…very difficult to determine which way to go. Or maybe full spectrum? I’m ready to move forward with a sauna, but not sure what to choose. First, I think that there is no such thing as full spectrum sauna…full spectrum light is usually used for treating SAD and mild depression, and sleep-cycle problems. If I were you I would go for a low EMF far infrared sauna, but it’s much more expensive than building your own near infrared one as instructed in this post. Both are safe in my opinion. I just bought a pair of Evo Flex Flexible Super Sunni Tanning Goggles. 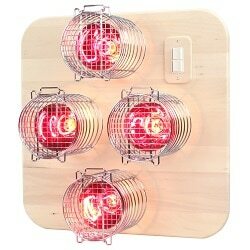 Are these suitable for the near infrared lamp sauna? Yes, they are fine. However, there’s no need to look directly at the lamp anyway, right? So, you’re all set. Thanks so much – will let you know how it goes. I’ve been using my homemade infrared sauna for about 2 months now. It’s the kind with 4 bulbs – attached to the shower wall. I sit on a little stool. It works great and heats up to 110 – 120. The only problem is it takes about 3 hours to reach that temperature and I don’t understand why. I put 2 sheets of mylar that I drape from the shower rod to keep the heat in. So I think my set-up is like most people’s. Do you have any ideas? 3 hours sound way too long. I have no idea why this is happening. Have you checked to the bulbs themselves to see if they heat up properly in about 15 minutes? Thanks for your reply Meital. I’m not sure how to know if the bulbs are heating up properly. I see them immediately turn red so I assumed they were heated up properly. This sounds like a stupid question but how would I know? I would wait 15 minutes and use a thermometer close to them and check the temperature. It turns out there was something wrong with my thermometer. I bought a new thermometer and the sauna heats up in 20 min as it should. Thanks so much for your help Meital. Ohhh…never thought of that…:) I’m glad you’ve found the problem. Enjoy your sauna! Thanks so much Meital. Another question. Dr. Wilson states in his Sauna Therapy article that in terms of supplements to replenish anything lost in sweating, he only recommends taking kelp and that you can take up to 4000 mg daily. This kind of scares me – it’s such a large amount. I don’t doubt Dr. Wilson but I recently heard a regular allopathic doctor state that if you take more than a small amount of kelp each day it is damaging especially if you have hypothyroidism which I do. What are your thoughts? Dr. Wilson also says to consume extra sea salt but he doesn’t say how much? What do you think? Personally I’m not afraid of large amounts of Kelp, I believe Iodine in high doses is helpful for the thyroid (you can Google Dr. Mark Sircus + thyroid to learn more). You can always start slow and listen to your body – it will tell you when it’s too much and you can simply stop there. I would just consume a high mineral beverage after the sauna – coconut oil is a good example. And add a bit more salt to my food. I wouldn’t stress about this too much. Thanks Meital. I will check out the website. I worry too much. Thanks for your reassurance! My progress. Thank you for this site. Hello! Would like to purchase one of your recommended wood far infrared saunas for our home. Can we just add a few 250 watt near infrared bulbs inside the unit to get there benefits of both near and far infrared? I’m being treated by a Naturpath for Lyme and severe hypothyroid…. I was wondering the same. I already have a 3-person low-EMF far infrared sauna, and I was thinking of a way to add in near IR bulbs. Would it be beneficial, or am I getting maximum benefits as is? I understand the differences between near & far IR, but does far IR cover what near IR does, as well? If you have a far infrared sauna – you’re covered. Great to know! When in the Far-IR sauna, are all body parts receiving the same benefit? Thinking in particular the backs of upper legs that are sitting on the bench, and the forward-facing parts — e.g. face, front, shins — Are those areas receiving the same IR energy, or would one have to change positions occasionally throughout the session? You have to change positions during treatment. FIR rays do not reflect back from other walls. However, the detox from sweating will generally improve your health and speed up recovery of all parts of your body. Hello, what if you can’t find the Rubylux bulb, will the Therabulb work? If not how do we know what bulbs are safe or ok to use? If you can’t find the rubylux I suggest you just wait a little, it is in high demand and will come back to stock quickly. Great info! I’ve been a little disconcerted with the $$$ of infrared saunas, but really need one for pain management and recovery. I like the idea of building one at home, but want to know if I could do more bulbs to cover more of the body or to accommodate two people? Any way to be able to lie down on a bench with overhead bulbs? Thank you. I set mine up in a walk-in closet with the lamps clipped to the main shelf, pointing down (power cords strung conveniently over the shelf’s support brackets to a power strip at the end). 4 in a row provides full body coverage lying down. Question about the bulbs.. the first 2 you mention specifically say infra-red and are about $25. (even saw one that say something like Garde B for $50)The third says floodlight and is $10 . What’s the difference, why would someone use more expensive one? infrared bulbs and heat bulbs are the same thing. They emit most of their power in the far infrared wavelengths. The Philips bulb does not specify the wavelength as apposed to the first two. Expensive doesn’t always mean better, but I would recommend the first two. I have the RubyLux and it’s very good. Hi! Thanks for the post. I have a walk in tiled shower area that was remodeled incorrectly and now leaks. (Not able to be fixed). I would like to “make lemonade” and turn this space into a sauna. It is about 3×3 – will this be enough space? It currently has glass doors and a tile bench. I almost wonder if I can just keep this in place and add the light panel in place of the faucet. Does the bench and walls need to be wooden? Would too much hot air exit into the rest of my bathroom? It is not large. Thanks for any advice…. I have a built in sauna in my home. 6’×5′ with a heater. Thermometer on wall. No outlets inside that I can access. Can I use your option of 3 bulbs on shower rack in my sauna? Can I heat my sauna to 100° then turn on infrareds? Can I use extension cord to plug in? Outlets nearby outside door. I don’t understand wattage and worried about blowing circuit breaker?? Will the EMF’s be less if use extension cord?? I wish I knew the answer to all your questions…I’m not very technical. Maybe someone in the community can answer? 3 bulbs is 750 watts. Use an extension cord rated for more than that (even the cheapest ones generally are), or even better, a powerstrip with a long enough cord, so that the powerstrip will trip if anything. Extension/powerstrip cords will emit the same EMFs as the lamps and power cords (unless shielded), so string them away from where you will be sitting as much as is practical. I purchased the 4 pack of Philips 250W bulbs from Amazon. 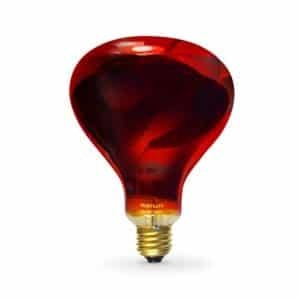 Is there a real difference between these and the more expensive Ruby bulbs?? I made a nice space in the corner of a bathroom but it only gets 85-90F even with the house heat on high. Wondering if I’m still getting benefit even when not sweating. Any good active up to date forums out there? I’m using it to detox from chemo for brain cancer. After being disappointed with finding only costly infra red bulbs on Amazon and eBay, I did more investigating and found where I could order bulbs from Sauna Space at $10 each. I ordered four and including shipping my cost was $53. After I receive the bulbs, I did a Google search for that particular bulb and found them on Amazon at four bulbs for around $23. And free shipping if you are a prime member. I don’t know why my initial Amazon search didn’t turn these up but they did show up when I did the search for the specific manufacturer. My opinion is that if these are the bulbs that are used by Sauna Space, they should be good ones. Thank You for the heads up. I was really bothered by the prices but just purchased those since they are cheap. Quick question, do you sweat when using these? I’ve been in my sauna now about 6 or 7 times and am beginning to sweat. I follow a FB group called Smart Detox with Niacin and Sauna. I’ve gathered from them that it may take some time to begin to sweat with infrared saunas. One needs to be hydrated and have enough electrolytes. Some recommend drinking a hot drink before the sauna or exercising to warm up the body ahead of time. I’m not that experienced yet so just passing on what I know. I buy them at Atwoods in a 2 pack for $8. We used to use them when doing composite repair as a heat source to cure the composite material. You could get the material up to 300 degrees so we had to be very precise about how close to place the lights to the material. I use them at home for sinus treatments during allergy season. Works great. A lot cheaper than Amazon. Thanks Meital for all the good info. I have Lyme disease with multiple co-infections. I’ve already begun using a single near infrared lamp (using a TheraBulb) with promising results. I’m very interested in the linear design you show in your video where each bulb lines up with your body parts. Could you please post how you made your hoist/pulley system for using above your bed — that’s exactly the design I’ve been looking for. Hi, do you have an opinion on therabulb? I have been using one bulb for for spot therapy, standing in front of it for back pain. I stay 12 inches away. Could I get two more and make a sauna? Thank you! Excellent tutorial. I wish I had it when I was making similar sauna a few years ago. Now I use it in our bathroom, which is very small. I prop it up against the bathroom door once it’s closed. I then sit on my Squatty Potty and face the lamps. I rotate every 5 minutes or so in an effort to get my whole torso exposed. I sweat quite a bit just this way, but if I really want to sweat, I will also plug in a space heater and heat the bathroom up more so I can get more sweating in. I also do infrared with my CEs, but I use my single lamp unit and clamp it on the drawer next to the sink and lay underneath it.. I have a small second bathroom off of our bedroom that probably measures 12’x5′. At one end of the room is a shower….with a sink in between the shower and toilet. Could I put a light panel in the wall in front of the toilet and sit on it or do I need to be able to turn around to get light on my backside? Also, is the space in the bathroom too big? I could put up a thick canvas curtain between the sink and the toilet if that would help. Your thoughts? Thanks for all of your great suggestions and advice! Not sure if this thread is still active. But I currently own a far infrared sauna and was wondering if I can just turn this into a near infrared? I’m not sure if it’s a low emf one. It’s a 3 man size. Hi, there. Maybe I missed it, but do you have a link for the additional heater recommended? Thank you! Is there any reason why you can’t put four bulbs in front and four bulbs behind in a large ten for more effective exposure? 8 250W bulbs seem a bit too much for me, at least depending on the tent size. Can you use a mylar tent for growing hydroponics and then just hook the lights up inside of it?? 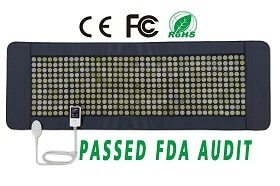 I want to build a low EMF far infrared sauna; can you recommend a source? I find LOTS of direction on building a near infrared sauna, even a low EMF version, and I get the impression I would have to buy the unit complete for what I want… The reason I want to make my own is that the space I have to use is small. The near infrared diys can be built in small spaces – do you know if space is an issue with building a far infrared sauna? No, I don’t think space is the issue. The issue with FAR infrared sauna is usually the EMF – in commercial ones, there is special EMF shielding to protect the user from the radiation coming from the carbon heaters. It may a bit complicated for someone who is not a professional. thanks for your posts was wondering after your session what about the sweat on the walls and ceiling or does it not get there ? I’ve never had sweat or condensation on walls or ceiling. Do you have pictures of your homemade sauna. Or anyone else who have home made saunas? I have pictures but don’t see a way to share them here. Hi, I purchased these exact products to make my sauna. I’m not sure if it is because my items are new or I should be concerned, but after a couple minutes of having then on I noticed a slight burning smell. I used therabulbs 250w and lamp clamps for 300w plus a power strip. Let me know if you noticed this smell going away after use. I built my sauna in my laundry closet. I used two 250 watt infrared bulbs. Is that enough to reap the benefits? Also, I cant seem to get the temp up higher than 95, and I really dont break a sweat at all…am I wasting my time laying in this thing? It seems that you may need another bulb in there. As for sweating, some people don’t sweat very easily. It could take a few more treatments and adding another heater in there. In any way, it’s definitely not a waste of time. Hi there. I already have an Ironman 2 person sauna. The control module keeps going out and I have to replace. It’s FAR. I want to convert it to Near. So, I have a small sauna, ready for the bulbs etc. Any recommendations on exactly what I would need to convert this? I’m just leaving the old elements and everything in it, and just mounting Bulbs on board on the wall and making a new power connection. How many bulbs for this space? Its a 2 man very small sauna. Barely two can fit. More like a one man. What kind of temps can I expect? I understand we need to sit 12 ” away from the IR bulbs. Do you need to rotate our body positions such that the IR rays penetrate the front, back and the sides of your body? For you DIY-ers who are not getting enough heat from your setup, have you considered draping a space blanket around the inside of you enclosure (and possibly on the top)? These Mylar blankets are rated to reflect 80% to 90% of body heat, so they should reflect the light from your IR lamps, allowing it to bounce all around and hit all of your body. Anyways, just a thought – if anyone tries this and has interesting result, please share. Below are some links to space blankets so u know what I’m talking about. Yes, this is how I set mine up. 2 layers of emergency blankets on each wall and over the top, and as a curtain in the front (thumbtacks, cheap metal curtain rods, zip ties and large binder clips came in handy for this). I already have a single-person FIR sauna. No room to add NIR lamps inside and maintain the 12″ distance. Since I’m getting the sweat from this FIR unit, I’m thinking that simply sitting close to an out-in-the-open NIR light panel should yield the same benefit (exposure to NIR waves) as an NIR sauna but without the sweat. (The purpose of the enclosure is to contain heat, not improve exposure to NIR waves.) Would you agree? i’d like to install 4 lambs into a nice piece of wood somehow, and than maybe attach a chain to the wood so that I can hang it from a hook either in the shower or a closet depending where I am. I need it to be easily portable and a nice slab of wood with the lights protruding out of it might be ideal for that purpose of moving about. do you have any ideas for installing these lamps into a piece of wood? or is it just a lot easier to clamp them onto a wire rack that can be hung in the shower, or in a closet, depending on what is ideal at the time? since I move about a lot i may have to change up how i use it. perhaps one place a shower is best, or another place a small closet will be suitable. I think that it is easier to clamp the lights onto a wire rack. It is just as portable as the wood, but both options are great. It just depends on how much work you want to put into it. Hi, this is an wonderful site and I really appreciate your answers! I’m thinking about having an electrician install outlets in my bathroom ceiling for 3 or 4 NIR bulbs, and lying down on the floor. Two questions–firstly, that will mean a distance of maybe 70 or so inches from my body–is that a problem? I know I can get the room hot enough by adding another heater, but is there an optimal distance for NIR light penetration between lights and body? Secondly, if i do my sauna lying down and sweating into a blanket, even if i turn around half way thro, does this mean my body is reabsorbing the toxins I’m sweating out? Many thanks for your response! To my knowledge 70 inches away is a bit too far to absorb the light properly. Also, if you cover yourself with a blanket, this also interferes with absorption of the light. You won’t reabsorb the toxins from sweating, but you won’t absorb much of the near infrared light as well. I hope this helps. Thanks very much! I actually meant lying on the blanket , not covering myself, but it sounds like this won’t work due to the distance factor anyway. So if I will be seated in front of lights, I’m wondering if you know of any safe (non-toxic) chairs that have backs (the backless stools trigger back pain for me.) Again, thanks!